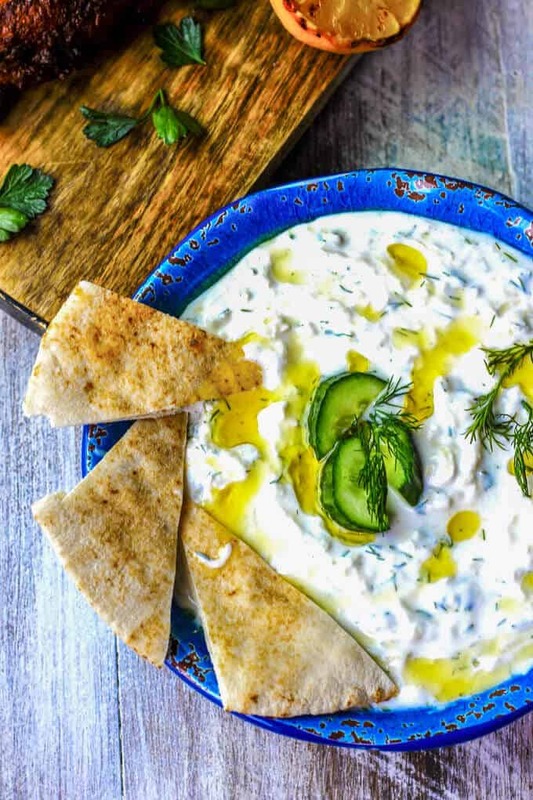 Traditional Greek Tzatziki Recipe combines real thick greek yogurt, seedless cucumber, garlic, dill and splash of olive oil and vinegar. 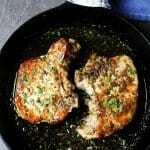 It’s a perfect sauce that can be paired with meals like grilled meats, vegetables, sandwiches, pitas or salads. 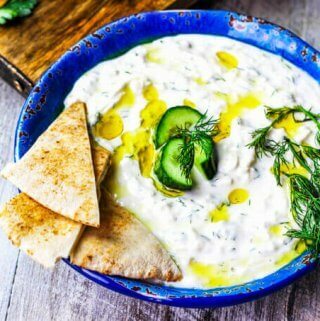 Traditional Greek Tzatziki Recipe is something I wanted to post for a while and I think this post is way overdue. 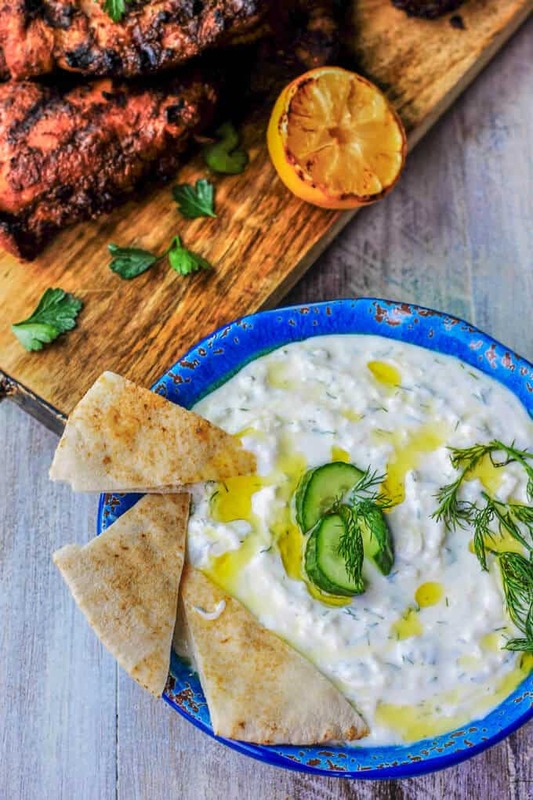 The good news is that the summer has just begun and this Traditional Greek Tzatziki Recipe can add a refreshing touch for your next BBQ. The Tzatziki tastes amazing when you pair it with grilled chicken like this Honey Harrisa Chicken Skewers, pork like this Brown Sugar Pork Chops with Garlic & Herbs or even just a burger like this Mushroom Black Bean Veggie Burger. 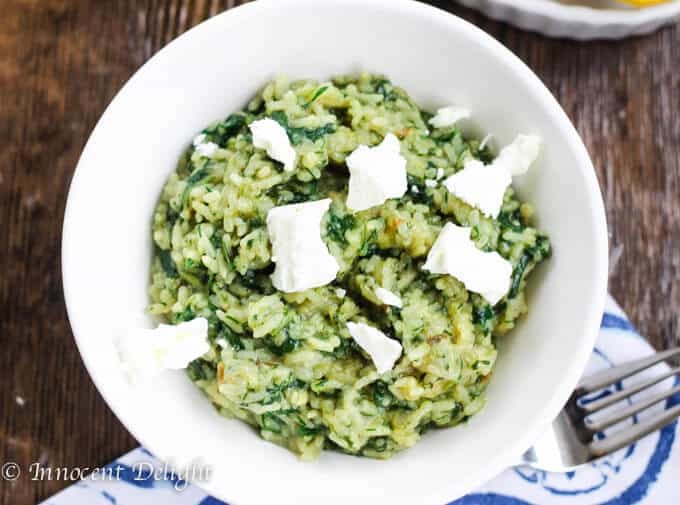 It can compliment grilled veggies (like zucchini, eggplant, portobello mushrooms, onions or tomatoes), or it can serve as an appetizer (Greek mezze) with pita chips or crudités. As you can see, there are plenty of possibilities for this sauce. 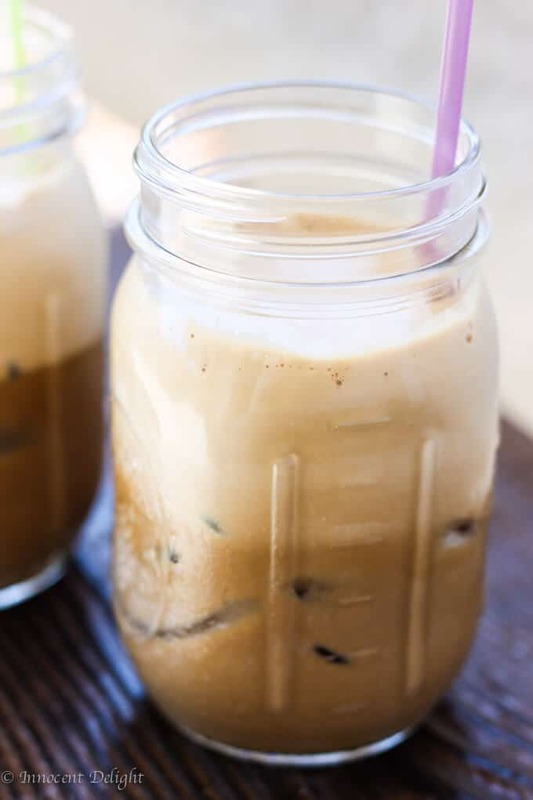 You may find this a useful recipe to keep handy all summer long. And that’s it. You just need to mix everything together and let the flavors marry. 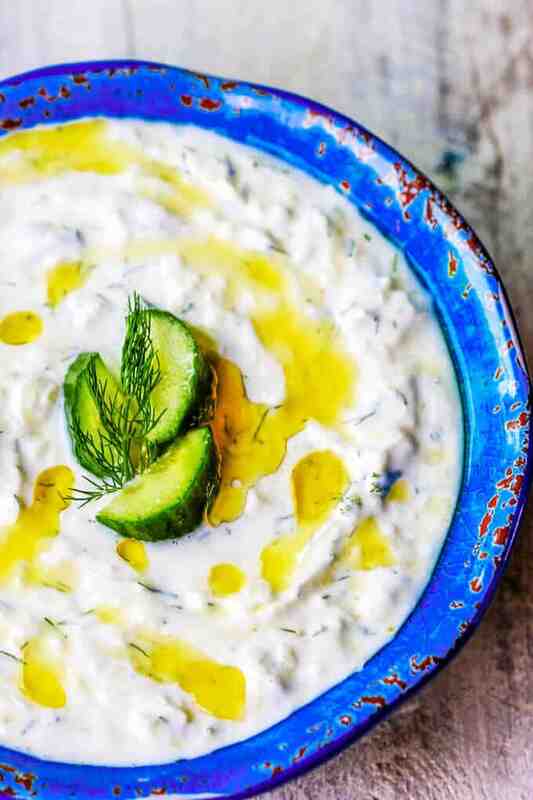 A Greek friend of mine once told me that to make the tzatziki “pop” you’ll need to add a splash of red wine vinegar. I’ve seen recipes with lemon juice or white vinegar but red wine vinegar is the most used vinegar in Greece, so it totally made sense to me. And after tasting it, it made even better sense. Mind you though, you’ll only need a splash; be sure that splash isn’t generous enough to change the color of the sauce to red. I must admit that I am so happy that America jumped onto the Greek yogurt bandwagon. It’s so accessible now, and there are plenty of really good options – including organic ones. Ever since my childhood trips to Greece, I’ve been in love with greek yogurt. Now seeing it everywhere really makes my heart happy. I can (& do) enjoy it whenever I want. Oh, and did I mention that I prefer it served savory, rather than sweet? 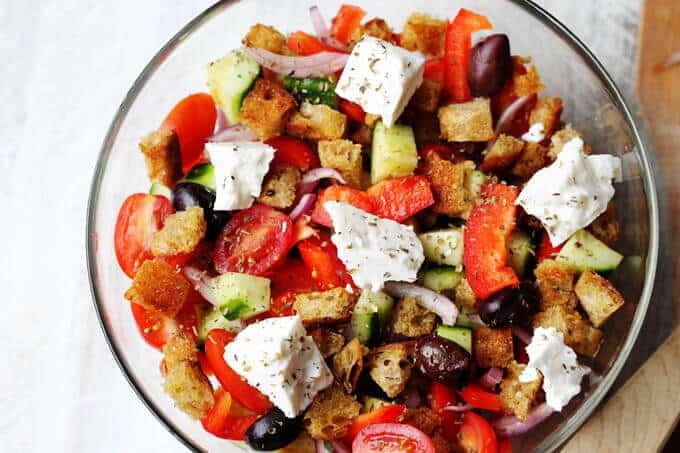 I often just add olives or tomatoes to my greek yogurt and eat it as a snack. If I need a zing, I can even add some herbs and cayenne to it. My husband thinks this obsession is a bit off, but who am I to argue with my tastes buds? I even used it as an addition to soups like this Golden Bell Pepper Soup with Cayenne & Greek Yogurt. Anyways, the abundance of this Greek yogurt has made it possible to have this Traditional Greek Tzatziki recipe whenever I feel like it. I hope you’ll like it as much as I do. 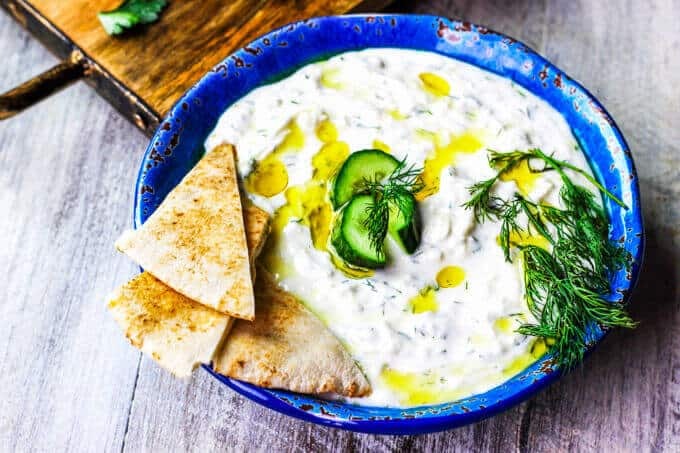 Oh, and by the way, know that while Tzatziki is a traditional Greek dish, other Mediterranean countries have adopted their own versions with different names. I found it very interesting. If you’re curious, you may want to check what Wikipedia says about it. 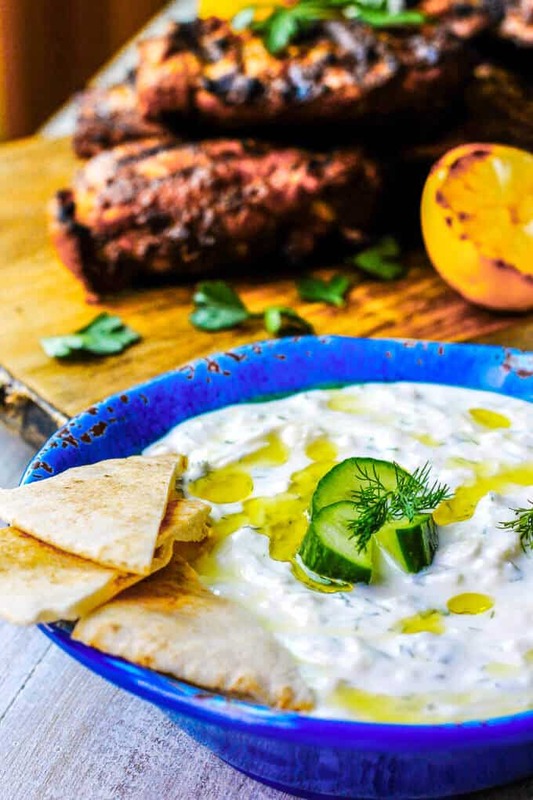 Traditional Greek Tzatziki Recipe combines real thick greek yogurt, seedless cucumber, garlic, dill and splash of vinegar and olive oil. 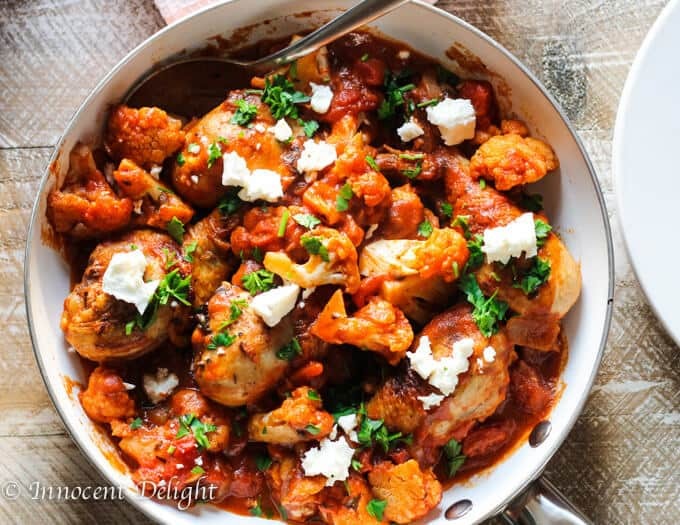 It's a perfect sauce that can be paired with any meals like: grilled meats, vegetables, sandwiches, pitas or salads. Shred the cucumber and if it is very watery drain it through the strainer. You can also leave it to drain for half hour or even over night in a fridge. Add minced garlic, chopped dill, yogurt, olive oil, vinegar and salt. Let the flavors merge for at least half hour. 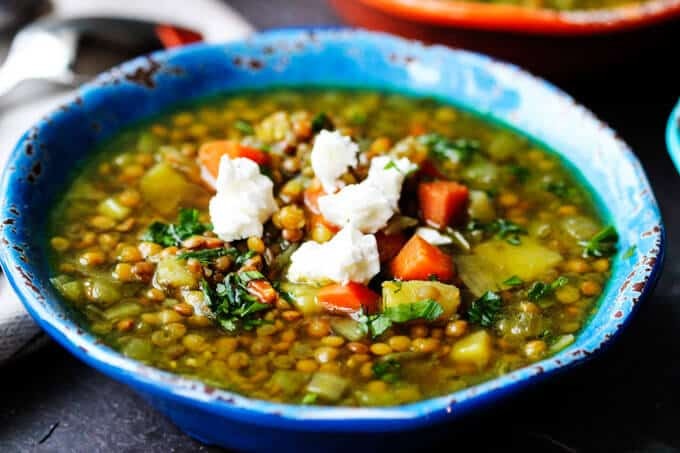 Serve it with grilled meats, veggies or as an appetizer with pita bread. 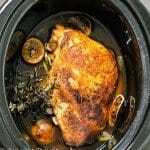 You can prepare the sauce the night before and let the flavors merge in a fridge overnight. This looks so good and I am also grateful that America has jumped on the Greek yogurt bandwagon. Thank you for sharing! 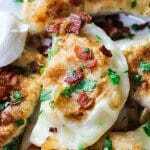 Luci’s Morsels | fashion. food. frivolity. That looks really good. I love (dairy) yogurt based recipes and that’s the only reason I can’t go vegan as yet. I am happy to see that you have used full fat Greek yogurt here. This looks fabulous! 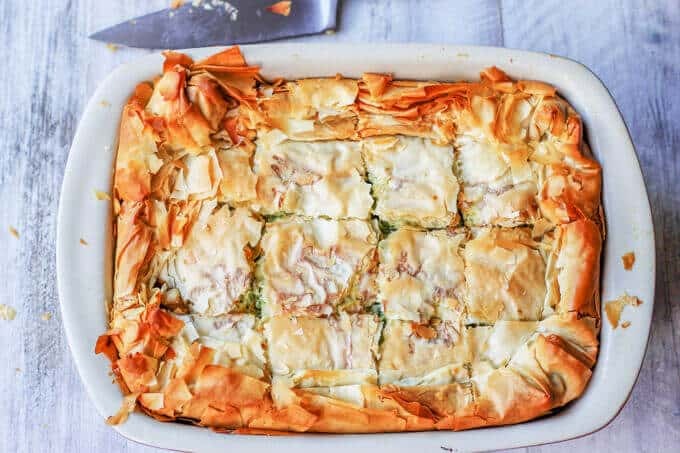 I love tzatziki and there’s nothing like homemade 🙂 Perfect for veggies, chips, wraps or just about anything! I basically lived on this when we were travelling round Greece. It goes on everything too. We make it at least once a week too.